Tomorrow -- Monday, August 13th -- starting a little after 1 pm PDT (20 UT), the moon passes in front of Venus. That's during the day for those of us in the US, but don't worry -- both Venus and the moon are easily visible during the daytime. The RASC handbook lists the time as exactly 1pm, but XEphem and some web sources show Venus disappearing at more like 1:30. The time isn't critical, because the most interesting part of this occultation is the lead-up, where you can see both Venus and the moon at once. The nearness of the moon will make it easy to locate Venus during the day, something that's usually a bit challenging even with this bright magnitude -4 planet. Binoculars should show both objects just fine, though a telescope is even better. In a telescope, you'll be able to compare the phases of the two objects: the slim crescent of the moon contrasted with the half Venus. If you've never seen a Venus occultation before, you'll be amazed at the difference between the brightness of Venus and the dimness of the moon's limb. We think of the moon as bright, but it's actually dark grey, about the same albedo (reflectivity) as asphalt; whereas Venus is covered with brightly reflective clouds. It's a great excuse to set up a telescope or binoculars for a late lunchtime observing session and share some photons with your co-workers or anyone else who happens by. I've heard an amazing number of adults express amazement at the idea of seeing the moon during the daytime (even though they've undoubtedly seen it themselves at some point, and just don't remember it). So seeing both objects, and their phases, should be a great conversation starter outside the cafeteria or local coffeehouse. I'd suggest setting up no later than 12:30, and earlier works fine. Even before 11, a low power eyepiece should show both the moon and Venus in the same field. Watch out for the sun! Try to find a place where you're shaded from the sun but can still see the moon. That way, not only do you stay cooler, but you're protected against accidentally swinging binoculars toward the sun and blinding yourself. Of course, what goes behind must come out again: Venus should re-emerge from behind the dark side of the moon around 2:30 to 3 pm. And now it's over. A fun event! It disappeared at about 1:35pm. 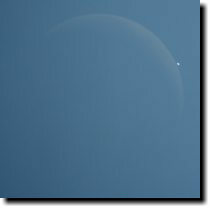 You can see my low-tech photos here: Daytime Venus occultation, 2012-8-13.